Gold Cube for the 21st Century! More added opportunities to spend time with your dog and children in the outdoors–and possibly have the trip paid for with gold! Talk to enough gold prospectors and you get a whole lot of ideas of how best to find gold and much more, get it. Along with those ideas of where to find gold has been a slew of tools, machines and doohickeys. Some are good, some not so good, and some have been downright impressive! What really got my attention is when Mike Pung, co-owner and developer of the Gold Cube asked, “Why are we in 2013 and we’re still relying on 19th Century technology to get our gold? !” Considering his wealth of knowledge, it’s no surprise Pung retired from the USAF in 1994 with years as an instructor in heat and air, hydraulics, electronic generation, and engine mechanics on gas diesel and jet engines. When he told me how much more different the Gold Cube is from what’s out there, mainly sluices and pans for placer mining, and then how much gold is lost in that process, I was hooked! Most technology on separating gold from material and quickly getting down to concentrates is based on the natural riffle system of a river. If you’re a steelhead angler like me, you know exactly what this looks like. After all this, is how Mother Nature naturally washes and catches gold that has been washed into waterways for centuries from lode or bench deposit high up the hill or mountainside. When you look at a gold cube it doesn’t seem that compelling, especially when you see all these other gadgets out there that dance this way and that, promising so much. That often is part of their problem, especially if you’re new to this and a one-person operation. For its dimensions, the Gold Cube does quite a bit because of co-developer Mike Pung and Steve “Red” Wilcox’s profound understanding of gravity and hydrodynamics: small enough to be easily transported and big enough and efficiently designed to do more than a long run concentrator. Basically what happens when you start pouring your classified material (8-mesh) , or black sand concentrates, onto the first stage’s landing area, is it gets washed evenly down into the first trough, using the effect of gravity to drive the gold straight down into bottom of the trough. As it was put to me by an old successful miners: gold sinks. It stays there, unless it’s light enough to rise with the much lighter material, or because of deformation, flutters up and down the next stage, which is covered by a special material that caused the water to move in a riffle mechanics that makes the water’s surface look like a patchwork of diamond patterns. What it does is within those “surface diamonds” is create a low pressure area. If you’ve ever flown a plane into a low-pressure zone, you know exactly what happens to the gold then. It drops like a heavy piece of rock. And since it’s pretty much the heaviest particle, it stays and the lighter materials continue on their way. The full Gold Cube package includes four separator trays, connective joints and plugs, a water pump that runs on a 12-volt battery, a collapsible stand and all the necessary tubing to get the water running properly. It has to be level to run properly, so the water runs properly across each separator tray. The Gold Cube running with the Gold Banker on top. In its most regulated form, one where water is brought along, a water tray system can be set up under the Gold Cube so that it can be a completely self-contained concentrator. The recommended container is a concrete mixing tub. Lowe’s at present seems to be selling the thickest walled, most durable. 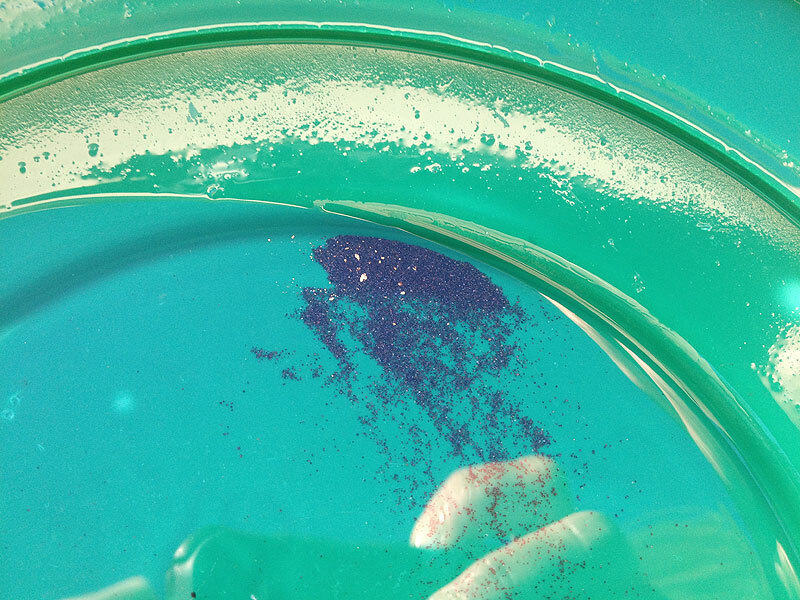 With the pump sucking water out of the tub, the water’s clarity can be extended by putting a elongate planter, or Tupperware, tub right under the outflow to catch all the processed material. 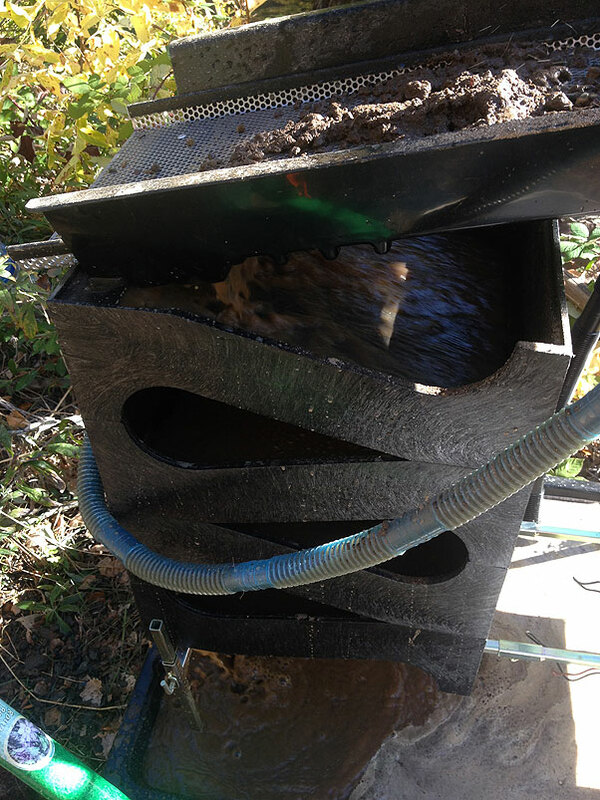 If you’re right next to a stream, or water source, you can treat the pump like a station suction dredge nozzle and stick it in a submerged bucket to keep material from being sucked in and clogging your tubing and ports. All said and done, my initial experience with the Gold Cube was very impressive. 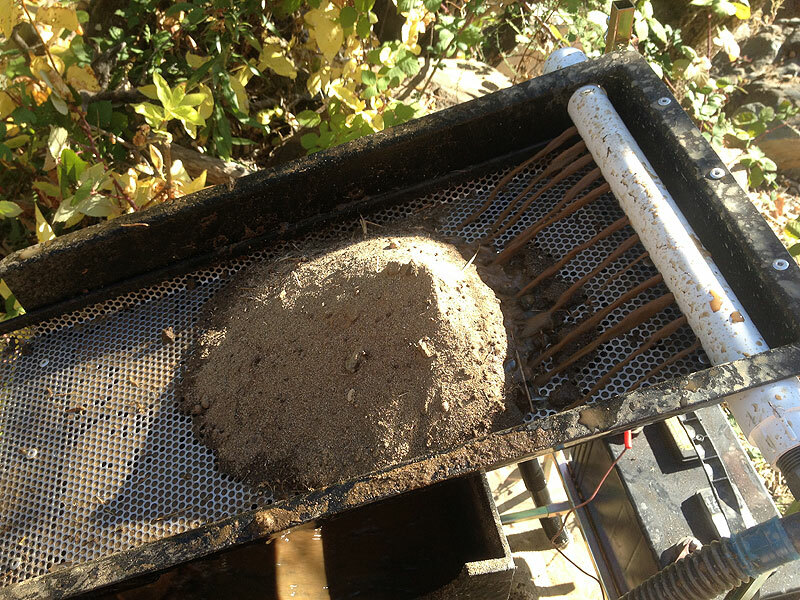 It’s not the amount of gold that caught my eye when cleaned out the Gold Cube after four 5 gallons buckets of material. It was the finite size the fines that the Gold Cube was able to separate out: we’re not just talking pinhead size we’re talking pin-point size fine gold. Nuggets are nice, but gold is valued by weight and purity—fines and flakes beat nuggets. —if there’s gold in your material, the Gold Cube holds it! Catching even the tiniest fines! As a whole package the Gold Cube might seem cumbersome to be carrying from site to site in search of a place to begin placer mining. Taking only the first two trays, tubing, plus a small 12-volt motorcycle battery, and you’re easily mobile. What about if you’d like to prospect and sample in a wilderness area that prohibits even the use of a machine? Fret not. Using water pressure created by river, stream or creek, you can rig a funnel to drive water down a hose and into the Gold Cube. If you’re reliant on prospecting in area that just has standing water, you rig a stand, or tie a line to the branch of a tree to hang a bucket with a hole drilled the bottom to take connective plug to run water through the Gold Cube per bucketful of water. The Gold Cube is just as adaptable, or evenmore so than a traditional sluice. The innovative qualities of the Gold Cube are so impressive that those who had pooh-poohed it at first have become some of its greatest proponents. The American Miner’s Rights Association even endorses the Gold Cube. Now, there is an add on, and from my experience using it, it really takes you from just doing classified material and concentrates, to high-production mode by allowing you to setup on a likely pay streak that you’ve found through sampling and then just start shoveling. The Gold Banker add-on basically turns the Gold Cube into a high-banker/beach box, which will classify the material you shovel and even catch small nuggets in two nugget trenches placed in the tray that holds the classifier, a spray array fluidizes the material down through the classifier, onto the nugget tray, and then onto the slick plate. 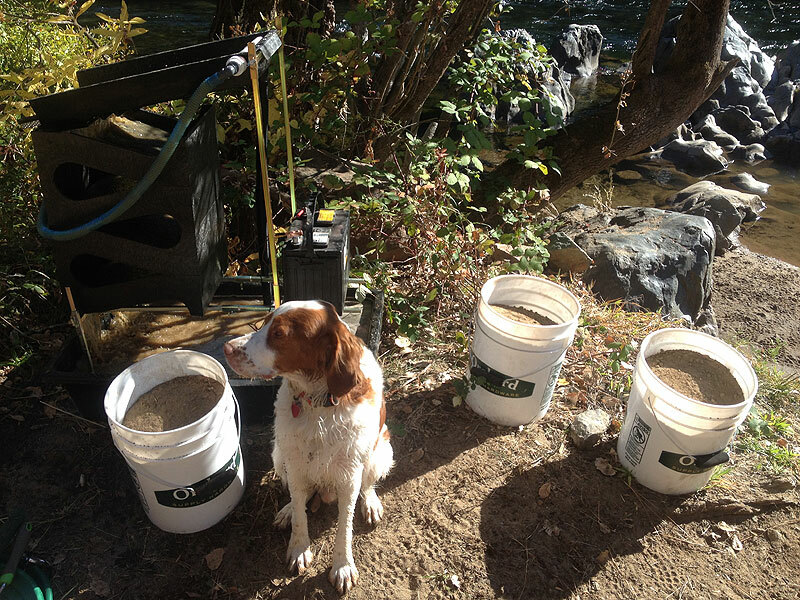 According to one source, on average it takes 100 buckets of material to produce one pennyweight of gold in most areas of the Central Sierras. That’s a lot of material. The Gold Cube can take it, and most importantly, you won’t be losing gold downstream for all that work! Stay tuned for new episodes Cork’s Outdoors TV in the field with the Gold Cube and Gold Banker. Here’s an interview with Mike Pung on Cork’s Outdoors Radio: Mike Pung and the Gold Cube. Cork Graham is the publisher of GCT Magazine and Cork’s Outdoors, and author of the international best-selling Vietnam prison/treasure hunt memoir The Bamboo Chest. For his latest books, writings, and appearances, follow him at www.corkgraham.com, Facebook and Twitter.